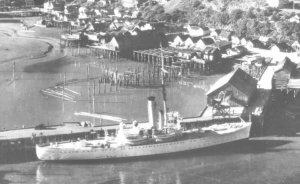 Juneau (134.413W 58.302N) became an important port town after Joe Juneau and his partners struck gold in the area in 1880. It became the Alaska territorial capital in 1900. Government and lumbering sustain the local economy. The town had a civilian airfield with regular flights, and a military airfield was under construction in late 1941 and was completed on 1 March 1942. The town was proposed by Roosevelt as the location for a summit meeting with Prime Minister Konoye in August 1941 to try to find a settlement between the United States and Japan. However, the proposal came to nothing.